This bikes comes out of State Bicycle Company’s Off Road Division. Anything that comes out of an Off Road Division gets me excited for starters. Apart from commuting I do pretty much all my riding off road. It’s just way more fun than riding on roads. 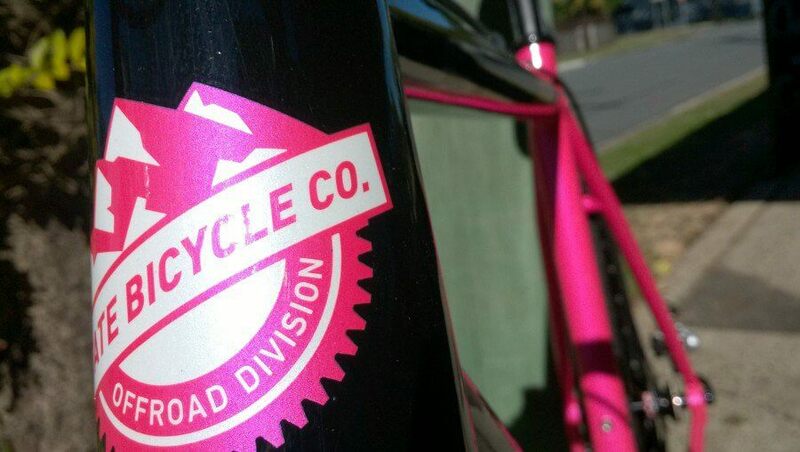 The State Bicycle Company has two bikes in its off road division, the SSCX and a fat bike. The spec on the Thunderbird makes it pretty clear its serious about getting off road. Not that I noticed till I got there. I had it in my head what an incredible road weapon this would be. And a bunch of numbers on a website are meaningless anyway, unless you’re prepared to actually read them. What I noticed in the flesh was some fat Kenda Small Block Eight tyres, a tapered headset, and gearing that’s not going to work on the road. It’s not your classic 32×16 mountain-biking singlespeed set-up but it’s not far off. Maybe it’s a 34 x 18. I didn’t count because I don’t much care for numbers and they don’t much care for me. The eccentric bottom bracket takes care of chain tension duties. It’s makes for a very neat rear end. It also means you can add gears one day if you lean that way. Though why you’d ruin a perfectly good bike with gears is beyond me. It’s probably a small chore to adjust, I don’t know, I’ve never lived with one, but the pay-off is clean lines and easy rear tyre changes. So sweet I could give it a kiss. Sadly I didn’t get long to play on the Thunderbird SSCX and unless you count about 20 metres of dirt I didn’t actually take it off road either. The moment you jump on the bike though it’s apparent that this bike is set up to play in dirt. I had expected it to be a roadish kind of cyclocross. Or maybe I just hoped that. But it’s clearly designed to be ridden off road. The geometry has a super-stable feel that you know will work off road. It left me begging to find the bit where the road turns to gravel to give the bike its head. It might not be set-up for it straight out of the box but it would make a great road bike. You’d have to swap out the front cog and swap the tyres. But once you’ve swapped the cog you’ve got a bike that’d conquer cities. Riding it I got that feeling I get on my mountain bike, where I feel like more is possible. I could balance forever on this thing. One-handed track stands were a breeze. I spent much of the ride with two dogs in tow. Stopping at an intersection, balancing one handed, turning 90 degrees and crossing, all under control, this felt easy on this bike. It’s similar to the feeling I get on my mountain bike. Everything feels right, like it’s meant to be this way, and things are now possible that weren’t before. Add to that feeling of confidence are the Avid cable disc brakes. These are a good choice on a bike like this. I’ve lived with Avid cable disc brakes before and apart from having to adjust them for brake wear they were reliable stoppers. I hadn’t used them with road levers but it felt good. They stopped the bike just how you’d hope they would. One thing about the hubs on these things, I didn’t need a bell on the bicycle paths. They’re noisy. I doubt it’ll bother anyone riding this bike the way its intended. In fact you’ll probably like it. But it kills any notion of creeping past people with their faces buried in their mobile phones and watching them jump in fright. Apparently some people are put off by the pink. I don’t get it. Call it watermelon my wife reckons. It’s looks too gorgeous to quibble. I’d happily ride this bike on road, off-road, or around the living room if I was allowed. It’s a marvelous looking bike with a great spec and would be a weapon any way you used it. I’d love to see one made up with road gearing. I’d swap the tyres but keep something nice and fat on it. In that spec it’s just about my dream bike. I did get rid of two bikes this year but I think I’ve still got some work to go before the shed’s ready for another. But it doesn’t hurt to dream does it?